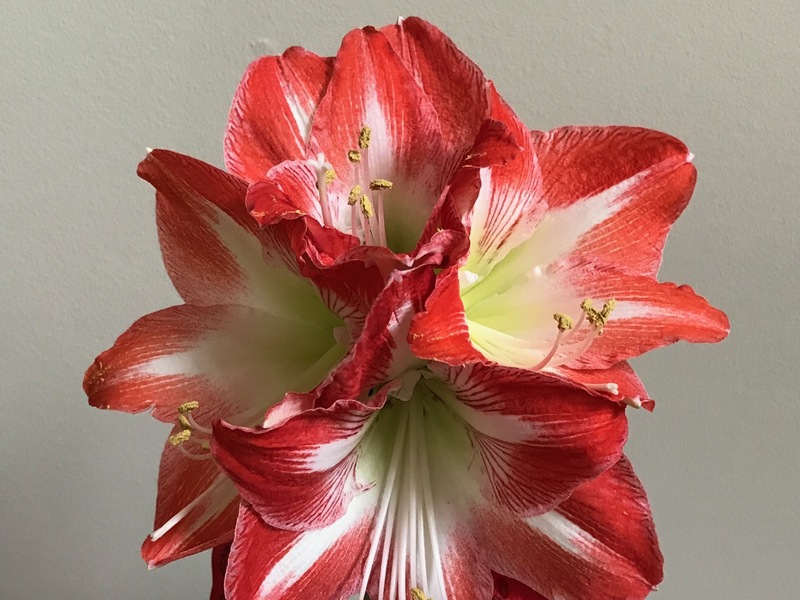 Wow that is one stunning amaryllis! I just got mine planted and some are already growing. Wishing you a wonderful, healthy and happy New Year! Thanks Donna, happy new year! Such a lovely bloom…Happy New Year. Thank you Noelle. May 2018 bring lots of joy. Thanks Alison, Have a happy new year! Glad you enjoyed the collection of vases from this past year. I maintained it diligently each week so it wouldn’t be a chore. 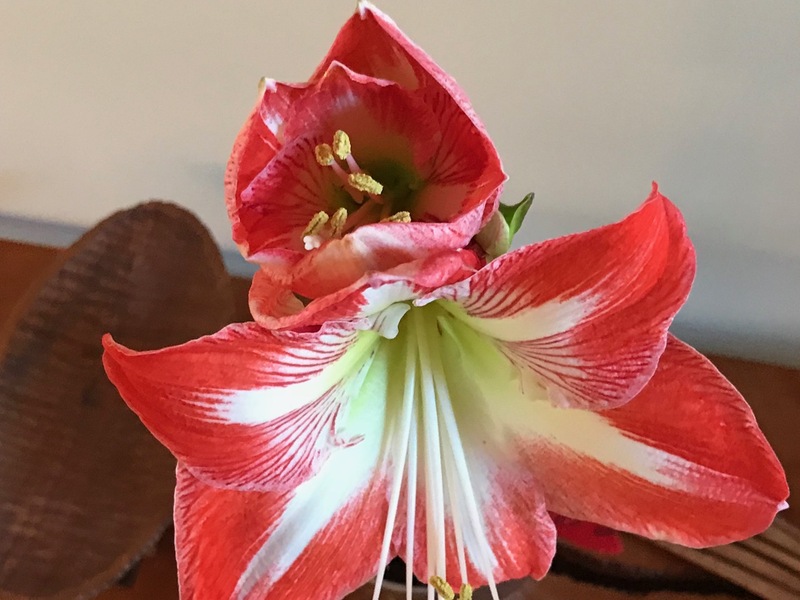 My sister didn’t know the name of the amaryllis, but the pattern in the flower reminded me of a peppermint. That Amaryllis is a beauty. I’m kicking myself for not planting any this year. Maybe you can find one on sale now the holidays are over. Thank goodness my sister planted three and shared with me. Your 2017 retrospective is wonderful, Susie! I should follow your example and maintain my own collage for next year (if for no other reason that it provides an excellent synopsis at a glance of what was blooming when). I wish I had your sister’s gift with amaryllis bulbs – those I planted in December are growing, albeit slowly. Of course, the plant’s growth and blooming process are part of its considerable appeal too. Best wishes once again for a happy and healthy new year! 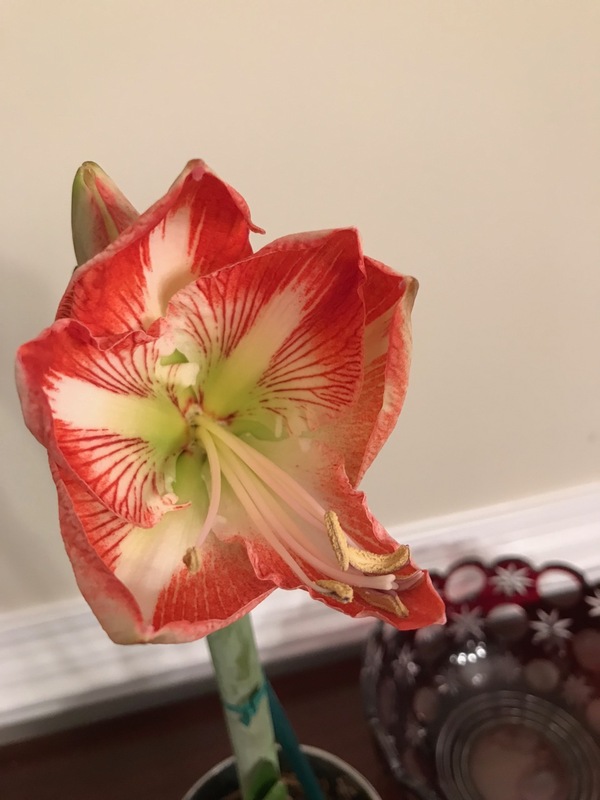 Kris, you’re so right about the process, so hop you enjoy watching the progress as your amaryllis bulbs develop. I’ve been glad I have those pages for each year of vases. I actually do refer back to them often to see what was in bloom, what vase I used with certain flowers and even whether I’ve already used a title. Here’s to a new year of vases! Oh my goodness! 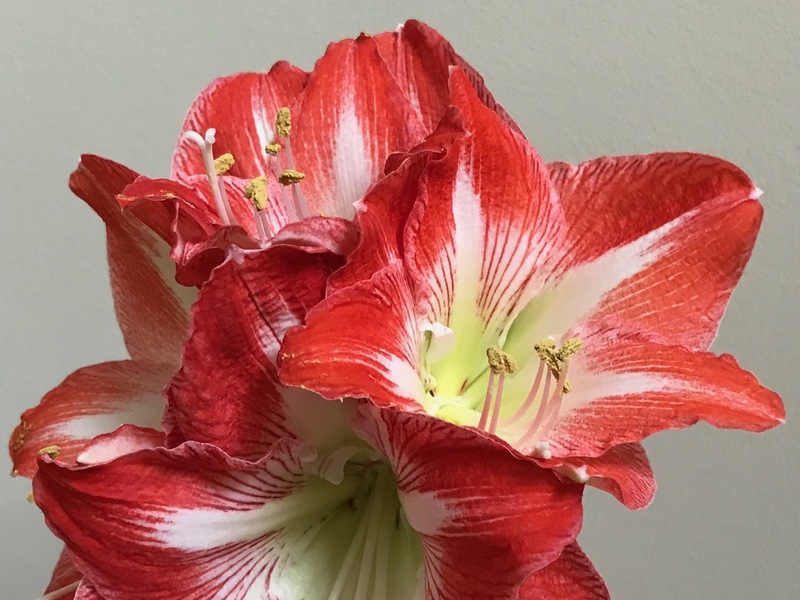 Your Amaryllis is beautiful. Now I am so excited to see how many blooms mine ends up with. Enjoy and happy new year! 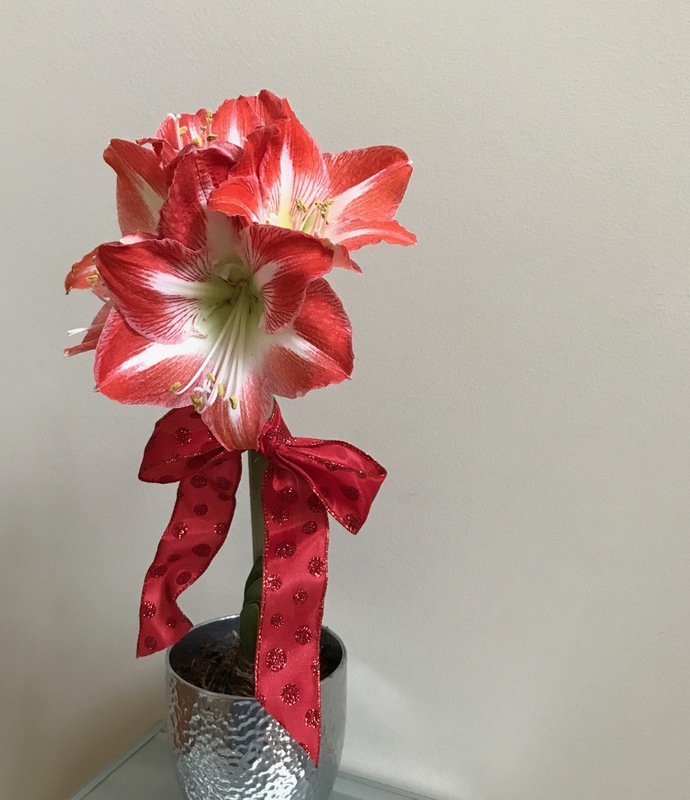 I had such a gorgeous Amaryllis last year (gift from Marian St.Clair), put it outside all summer, really took good care of it (!!) but alas….it is simply not flowering or have any new growth at all. I should lend it to your sister! Happy New Year Susie. 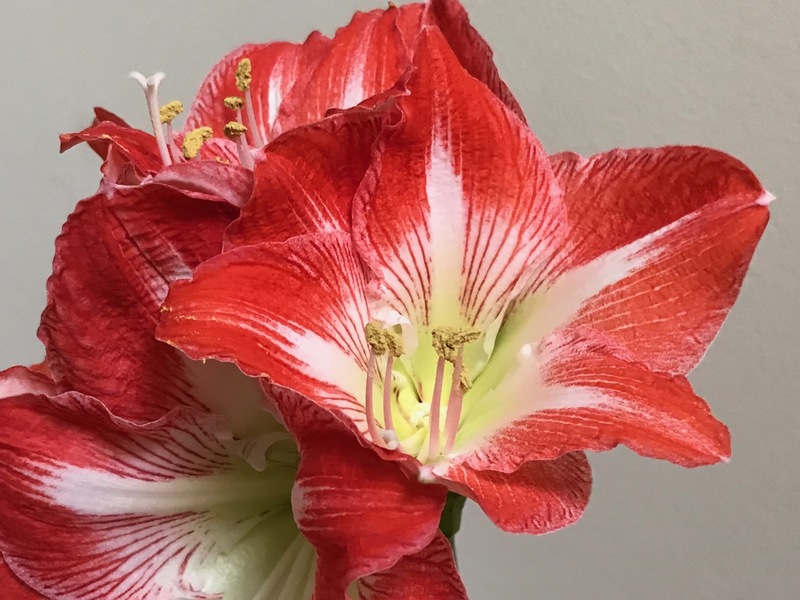 I love how the amaryllis blooms develop so quickly and remind you that things are still alive and growing in spite of the weather outside. Love the collage, it’s like the idea book for a florist, they’re all so well put together and staged!